I began with a Garden Green card base cut 5 ½” x 8 ½” scored at 4 ¼”. Then I punched out 8 large petals, with the Festive Flower punch, from Real Red cardstock and 4 smaller petals and 2 of the double petals also from Real Red cardstock. I then punched out 3 of the large petals from Garden Green cardstock for the leaves. 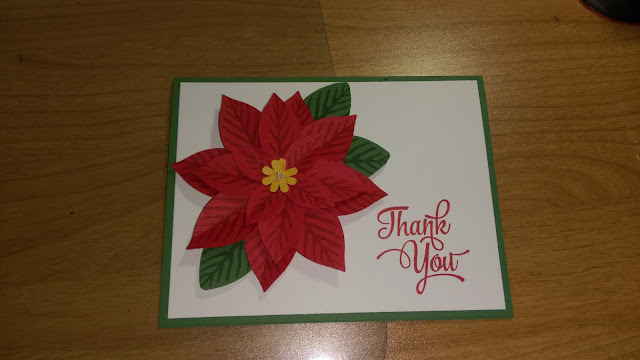 I stamped the Thank you from the One Big Meaning stamp set found in the annual catalog, onto a piece of Whisper White CS cut 5 ¼” x 4” and adhered that to my card base. I then stamped all of the flower petals with Real Red ink and the leaves with Garden Green ink. To build the flowers, I punched 2 circles from Real Red cardstock with a 1” circle punch. I applied Fast Fuse adhesive to the first circle and began adding the larger petals. To get a nice fullness to the flower, I first folded each of the petals to add dimension. I then began placing them onto the circle. I started by placing them into a + formation then placed the remaining 4 petals in-between in a pin-wheel like formation. I then added Fast Fuse to the second 1” circle and added the 4 smaller petals, also in a + formation and adhered that on top of the larger petals off-set using a Stampin’ Dimensional. I then added the 2 double petals also with a dimensional and placed the Garden Green leaves onto the back of the completed flower using Fast Fuse. I then added 2 flower centers, off-set using Crushed Curry cardstock that I punched using the Festive Flower punch. I then added the flower to the front of the card using 3 Stampin’ Dimensionals. And finally, I added 3 tiny pearls to the center of the flower. So, that’s the card for today. I hope you like it, please share you thoughts with me at the bottom in the comments section, and I wish you all a great day. See you Saturday!